Time to get those kids outdoors! Hula Hoops are a great way to have your children burn off that crazy, pent-up energy from the rainy days! We have them. We also have a variety of toys perfect for playing outdoors and others that make for a great time on a rainy day (goodness! Did I just say that out loud!?!?) 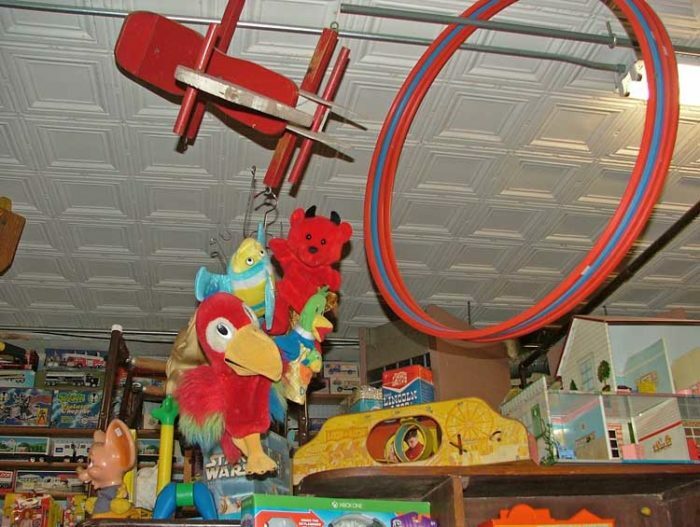 We have metal trucks and cars, wonderful stuffed toys, doll houses, action figures, trading cards, dolls, and yes – games! Do you know when the first Hula Hoop was marketed? Or the kind of ‘hoops’ different cultures used previously to the toy we are all familiar with now? Read below then click the link to Wikipedia for more information! Interesting! The hula hoop gained international popularity in the late 1950s, when a plastic version was successfully marketed by California’s Wham-O toy company. In 1957, Richard Knerr and Arthur “Spud” Melin, starting with the idea of Australian bamboo “exercise hoops”, manufactured 1.06-metre (42 in) hoops with Marlex plastic. With giveaways and national marketing and retailing, a fad was started in July 1958; twenty-five million plastic hoops were sold in less than four months, and in two years, sales reached more than 100 million units. Carlon Products Corporation was one of the first manufacturers of the hula hoop. During the 1950s, when the hula hoop craze swept the country, Carlon was producing more than 50,000 hula hoops per day. The hoop was inducted into the National Toy Hall of Fame at The Strong in Rochester, New York, in 1999. The hula hoop craze swept the world, dying out again in the 1980s, but not in China and Russia, where hula hooping and hoop manipulation were adopted by traditional circuses and rhythmic gymnasts.